Without delving too deeply into hypotheticals, I’m going to describe a broad method of thinking which may assist in developing strategies to increase profitability in your establishment. As an experienced bar manager, I’ve concluded there are three core internal dimensions or ‘drivers of success’ in the hospitality industry which define and drive a venue forward. Profitability is the primary driver of any business, and is achieved by performing a process which delivers a high return-on-investment (ROI). Profitability is basically achieved by ‘selling products at a higher price than purchased’, but in hospitality, operational costs incurred by selling such products takes a large slice of the profit-margin pie. This is where staff culture, productivity and customer service come into play. A positive staff culture will promote efficient customer service and productivity techniques which therefore increases your establishment’s levels of profit. A positive staff culture is therefore the fundamental building block for greater profitability, through high levels of customer service and productivity. 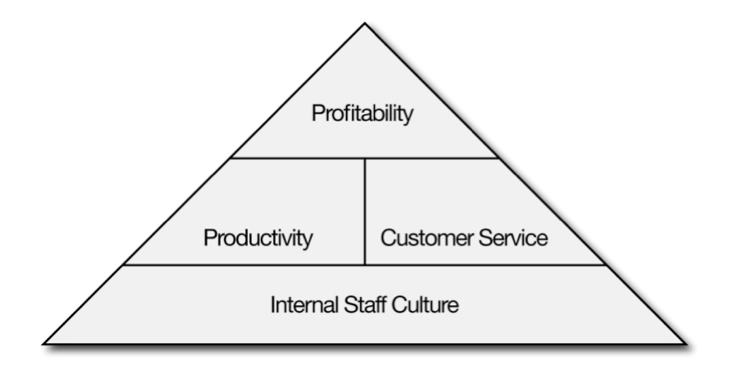 The pyramid of hospitality profitability: A positive internal staff culture drive strict productivity techniques and customer service methods, which are the overall foundations for greater profitability. If you wish to squeeze greater profit from your establishment, the enhancement of productivity and customer service serve as strong building blocks for greater profitability (hence their position on the pyramid). Money saved on wages is most likely going to end up as more profit in your pocket (or money put back into the business). There are many techniques to increase productivity in the hospitality industry, some of which I have detailed in the pages to follow. The best way to formulate methods to save on wage costs is to sit down with your key staff (key staff are different to senior staff – key staff are your essential, high performing staff and can range from bar backs to senior managers) and do some brainstorming. You’ll be surprised with the ideas your team synthesizes as a whole. And, the process will build morale amongst your staff. It’s cheaper to keep existing customers than find new ones. If it’s cheaper to keep existing customers, the money you save on marketing (to reach new customers) is most likely going to be profit (or money put back into the business). And by enhancing your customer service techniques, customers are going to be satisfied with your product, which is a great sales catalyst: they are more likely to spend more, and re-visit your venue again and again (to spend more money). Satisfied customers talk to their peers which creates a positive ripple effect for your establishment – word-of-mouth marketing is extremely powerful, and also extremely cost-effective. Internal staff culture is an extremely influential factor in determining the levels of productivity and customer service your staff will deliver. As the ‘base’ of the profitability pyramid, a positively orientated staff culture will assist your staff in delivering optimal levels of productivity and customer service, which therefore feeds upwards, towards delivering greater profitability. Look at it this way: if your staff work happily in a consistent, high-morale environment, where they are respected, remunerated correctly and offered training and career progression (basically in an environment with a great internal culture), they are more likely to work harder and more willing and able to offer greater levels of productivity and customer service.